It’s time for my weekly Monday design team post for Visible Image and today is an extra special day as it is the birthday of none other than Mr Visible Image himself , Mark Alexander or Mr Awesome as the design team often call him, designer and co owner of Visible Image stamps. 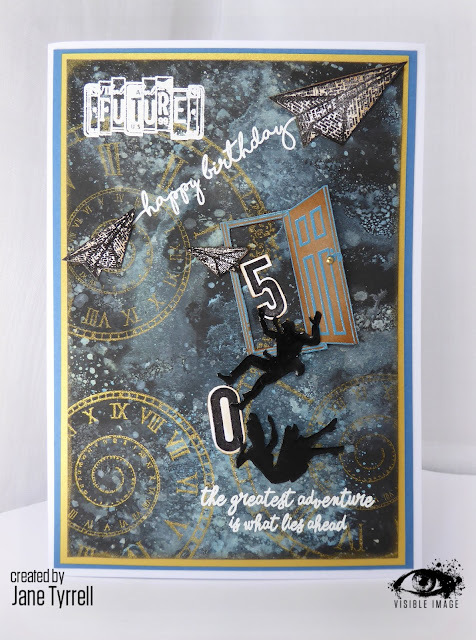 I decided to make him a special card as it is rather special birthday for him… he is joining the 50s brigade….yay! I thought long and hard about my design and I know that Mark likes my galaxy inked backgrounds so that was my starting point, together with one of his awesome stamp sets, which I know he is particularly proud of designing. I don’t have any process photos, as I was busy at the time also making my Wonderland samples, so I will talk you through how I made it. I made my galaxy background using distress oxide inks on black card stock. Then I stamped the time swirl in gold ink. I inked up the door for the first time, which is such a fun stamp, onto Kraft card, and embossed it in pale blue. I added a brass brad for a door knob. 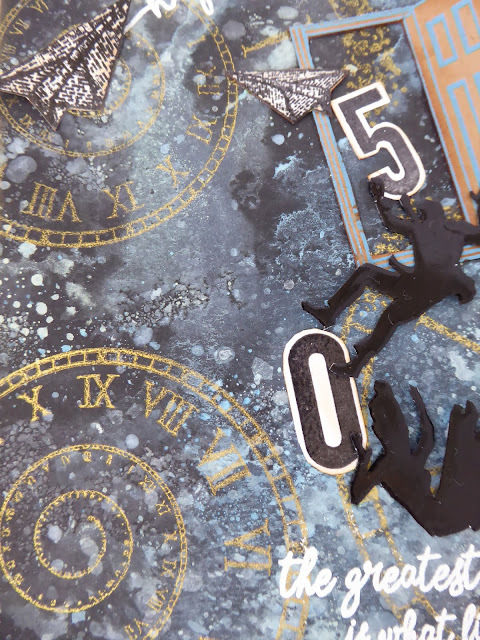 The numbers, planes and falling man and woman were all black embossed and fussy cut out. 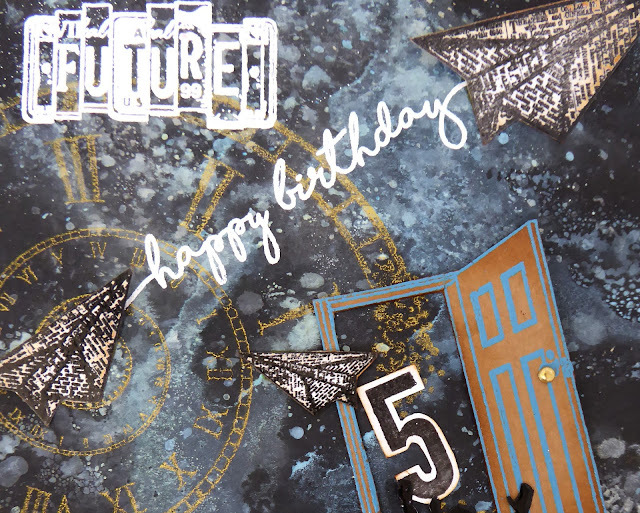 I stamped the happy birthday sentiment from the Go to Words set and set it off into space propelled by the planes (OK that is a bit of artistic licence there from me 😂). 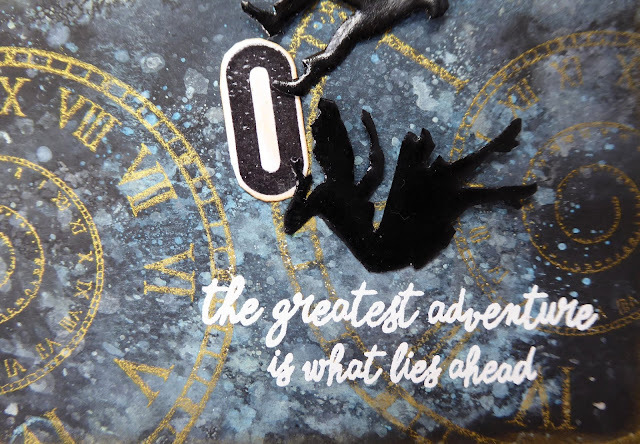 I also used the fab sentiment, which I white embossed, from “Destination unknown” as I thought it was so appropriate for Mark. Here it is once more.. I made it with my fondest best wishes for such a talented man and a good friend. So if you would kindly clear your throats and join me to virtually sing….. I hope you have a fantastic day with Helen and here’s to even more exciting adventures together. I just love being a part of the Visible Image journey. We will be back tomorrow with an amazing project by Lisa Taggart which was also made for Mark’s 50th! We’ve had a brilliant long weekend of celebrations, it’s back to work tomorrow and Mark will be finalising the designs for our September release… we are both so excited for these new stamps and stencils!!! This entry was posted in Birthday cards, Cards for men. Bookmark the permalink.